Whether your children share a bedroom or you are looking for a fun, youthful style, the Wrangle Hill collection will meet your needs! With a variety of bunk beds and storage pieces, the convenient space saving designs will add functionality to your child's room. Solid pined construction and a warm Amber Wash finish offers a relaxed and comfortable style that will blend easily with casual decor. Welcome the Wrangle Hill collection into your home and create the perfect look for your child! 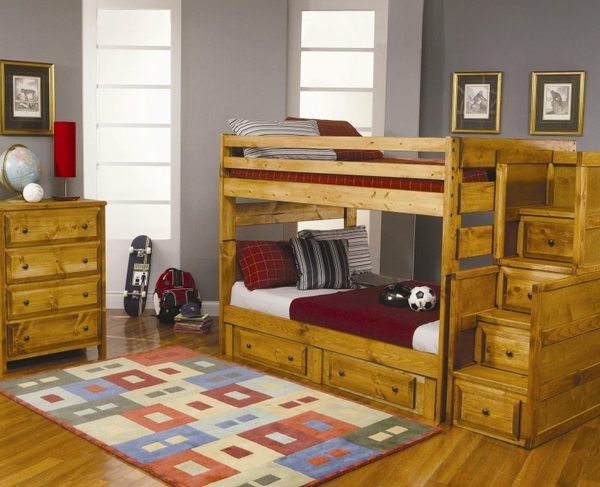 Price above is for Full Over Full Bunk Bed and Chest. You can piece your set together using the options below.